MILAN – Two Italian commuter trains collided Tuesday in the southern region of Puglia, killing at least 20 people, the president of the southern Italian province said. Dozens of others were injured when the two trains, each with four cars, collided head-on near the town of Andria on a line with just a single track, according to news agency ANSA and Sky TG24. A still photo of the crash showed cars crumpled together and forced off the tracks at sharp angles. News reports said rescue workers were pulling victims from the rubble, including a small child who was alive. Video images showed ambulances responding to the scene with other rescue workers. 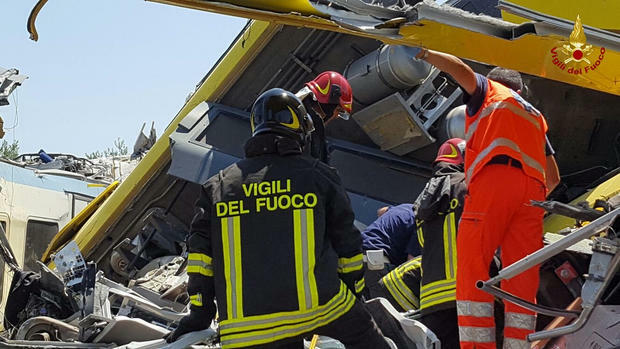 “Some of the cars are completely crumpled and the rescuers are extracting people from the metal, many of them injured,” Riccardo Zingaro, the chief of the local police in Andria, told ANSA at the scene. Firefighters work at the site where two passenger trains collided in the middle of an olive grove in the southern village of Corato, near Bari, Italy, in this handout picture released by Italian Firefighters, July 12, 2016. Italy’s prime minister, Matteo Renzi, said the train crash “is a moment of tears” and pledged not to stop until a cause was determined. Renzi spoke in Milan but was returning to Rome to monitor the situation. The two trains that crashed head-on in Italy’s southern Puglia region belong to a local private rail company, Ferrotramviaria SpA. Italy’s national rail service, Ferrovia dello Stato, identified the company in a statement Tuesday, offering its condolences and support services. Ferrotramviaria is a Bari-based private train company that connects the capital of Puglia with regional towns to the north and the airport, operating about 20 small electric trains. It was founded in 1937 and serves students and commuters.